However, I do have a good out. With everything that’s going on right now, we can’t really afford to take on that kind of debt obligation. We might have to move. Credit checks might be performed before we can get into an apartment or buy a different home. There are a number of obligations coming up, and we need our credit situation flexible. So I said that we probably couldn’t. My relative was understanding of the situation, and I gave this person some alternative ideas to getting some of the money he needed without the need for a co-signer. But the question threw me back into thoughts of whether or not it makes sense to co-sign for someone else. Are You Prepared to Take on That Debt? Technically, the borrower is supposed to repay the loan. In a perfect world, you co-sign on the debt, the borrower makes payments on time, builds a bit of a good credit history, eventually pays off the loan. This is a nice theory, but what happens if the borrower doesn’t pay? When you co-sign, you agree to take on that obligation. So, if the borrower doesn’t pay, you have agreed to cover the debt. So you need to be in a position to pay off that debt — just in case. You don’t just have to be ready to pay the debt. There are other consequences associated with co-signing a loan. First of all, the obligation is seen as yours. So, even though the borrower is supposed to be making the payments (and even if the borrower is making the payments as agreed), the debt “counts” against you. When prospective lenders look at your debt load trying to make a determination, they will consider the possibility that you will have to pay that debt — and that means you might appear to have a higher debt-to-income ratio than you technically have. If the borrower ends up missing payments, that will reflect on your credit as well. So, even though it isn’t your loan, you’ve claimed responsibility for it. When payments are missed, it can drag down your credit score. This is part of the incentive you have for making sure that the borrower is paying on time. This can lead to other issues, particularly those having to do with your relationship. If you are afraid that your relative’s habits could lead to a drop in your credit score, you might constantly be keeping tabs on what he or she is doing. That kind of nagging (did you pay your bill on time?) can ruin a relationship. Even worse is if the borrower does default and you are stuck with the consequences. That can lead to a great deal of resentment on your part. Do you trust this person to repay the loan? How well does this person manage money? If there was a problem, would the person come to you immediately to work it out, or would he or she try to hide the issue? Can this person actually afford the loan payments? If the answers to these questions don’t fill you with confidence, you shouldn’t co-sign. There are times when parents co-sign their children’s loans (my first car was bought with my parents’ co-signing help), but it gets sticky otherwise. And, even in the case of a child, I’d be wary of putting my own financial situation at risk. What do you think? Does it ever make sense to co-sign a loan? I might be willing to cosign for my children one day, but I wouldn’t feel comfortable cosigning for any other family members or friends. Yeah. I think there’s a definite difference between helping your (responsible) kids and risking it on others. Exactly. In this day and age, it’s just so difficult to trust people. I would give the person the cash but not cosign a loan, it can hurt your credit and have a bad impact on your relationship. If you consider the cash lost money, or a gift anyway then you are not bitter if the person doesn’t pay. I would limit the person to sibling parents and children as well. I like this idea, if you have enough cash. At least, you could provide cash that could work as a down payment, or maybe multiple people could contribute to the cause. Miranda! This is a non-negotiable no for us, but I love your well thought out pros and cons along with a list of very good questions. Pauline makes an excellent point too about considering cash so that no one can ruin your credit if one really wants to co-sign!!! You’re right that sometimes you make it non-negotiable — and make sure everyone knows it! Then they won’t ask. If its not my wifey then the answer is no. Ill let you have some money and even that will be money I dont expect back. Co-signing puts too much on my plate that I have to rely on another person to be responsible for. I agree that one of the hardest things is relying on someone else to be responsible. Do you trust that person enough to put your credit in their hands? Unequivocally, no way. I’m all for helping out those in need. However, there’s other ways to go about it. I wouldn’t co-sign for friends nor even family (thankfully I’ve never been asked). The risks are just too high compared to the small about of potential benefits. I agree. The damage that could be done to the relationship just isn’t worth it. I never co-signed for a loan and never would. 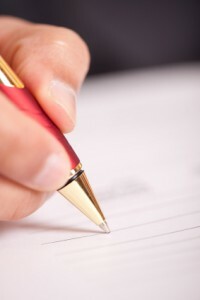 Co-signing is guaranteeing that you will repay the loan if the other person defaults. It can be risky. My parents cosigned for me once when I was younger and that worked out ok. I like the qualification. You really do need to make sure that you’re cosigning for someone responsible. My parents helped me with my first car loan — and they haven’t had to help since. Absolutely. It has to be someone you trust and know very very well. I’m curious (and if they know your blog I would understand why you wouldn’t share it here) what the conversation looked like when you let them down that you wouldn’t co-sign. I know you left a few details, but I’m just curious what your advice would be on letting someone down on this front so it doesn’t burn the relationship. I will say, if the relationship is a little burnt, it’s better than the potential destruction of a relationship if that loan defaulted to you! I personally have co-signed a loan for my brother, but its something I would only do for people I really trust. That trust has to be there. 🙂 My in-laws cosigned on a private student loan for me back in the day. It worked out well, but, again, they trust me. I won’t be cosigning for anyone anytime soon! Too many risks, and for the people I would consider doing it for, frankly I value the relationships too much. Me too. If things went wrong with those relationships, you would regret it. No, there is no way I’d ever consider even co-signing for anyone. When I was growing up I didn’t need it and I save my own money or got my own jobs. I’ve seen co-signing go wrong on so many occasions. If someone can’t afford it they don’t need it. CBB! Glad to see your hard line on this. I too have seen total disaster with co-signing right in my own family. What a freakin’ mess! I’d rather have The Plague. Never thought of it that way before. I guess people should work hard and save up for what they need. What about in a tragedy of a loved one though? Would you help out then? I’ll only do it for people I trust like my mom and my best friend, but still depends on the situation. I think it would have to be a tragedy for me to help out. The risk is high.